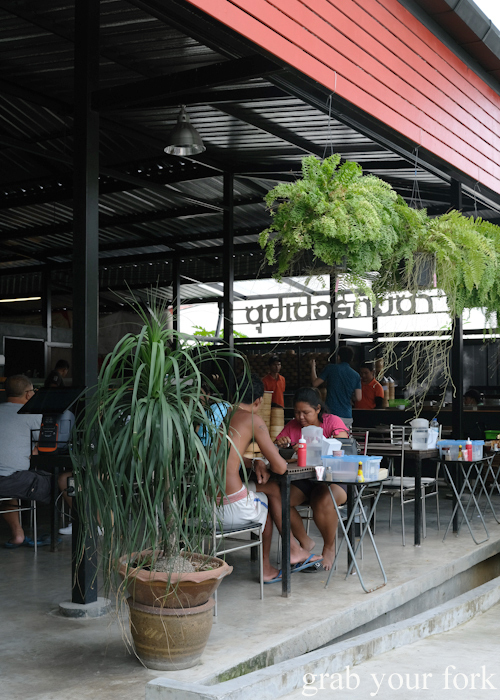 So your next Thailand trip involves you arriving late in Phuket and leaving the next morning? This post has your stomach covered. Two amazing meals. Unlike anything you've ever had. For cheap. 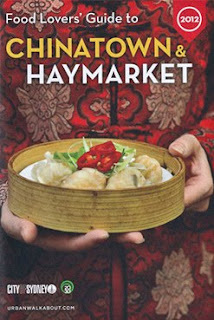 We're talking late night comfort food (with Michelin Guide kudos) and a choose-your-own dim sum adventure. Strap in. Our Thailand trip last November kicked off with a late night touchdown in Phuket. We checked in, dumped our bags and headed straight back out to Go-Benz Phuket. Go-Benz isn't fancy. But it's not supposed to be. 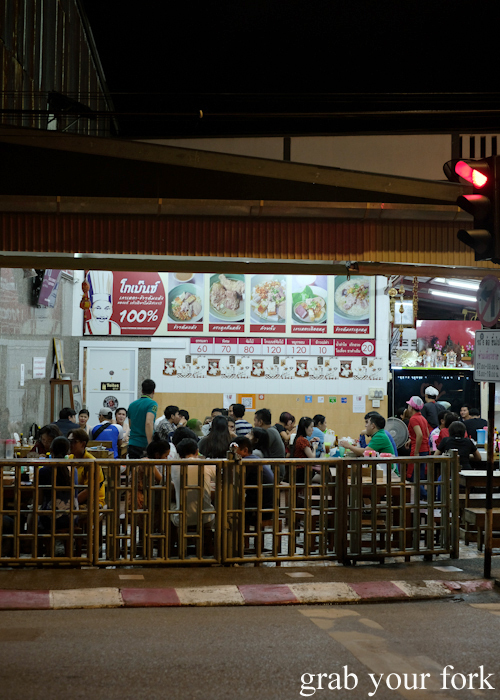 This massive roadside restaurant in the heart of Phuket Old Town is famous for its dry congee. Say what? 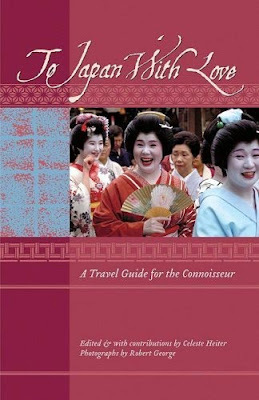 Basically it means a bowl of rice topped with fixings served with soup on the side. Go-Benz has such a reputation they were recently awarded a Michelin Guide Bib Gourmand, recognising its "simple yet skillful cooking for under £28 or €40". 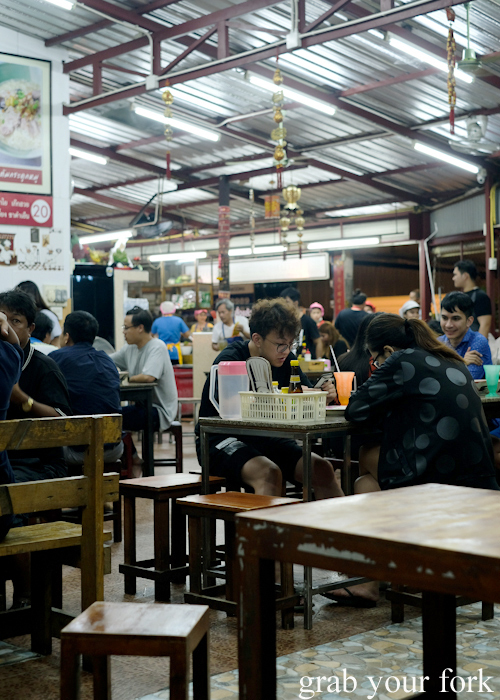 When they open at dinner time, queues tend to snake around the block. It's said the best time to arrive is after 10pm, when you're more likely to score a table immediately. 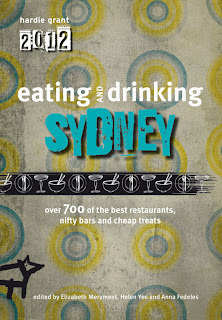 The open kitchen is worth a look, both to work out what to order as well as a way to whet your appetite. 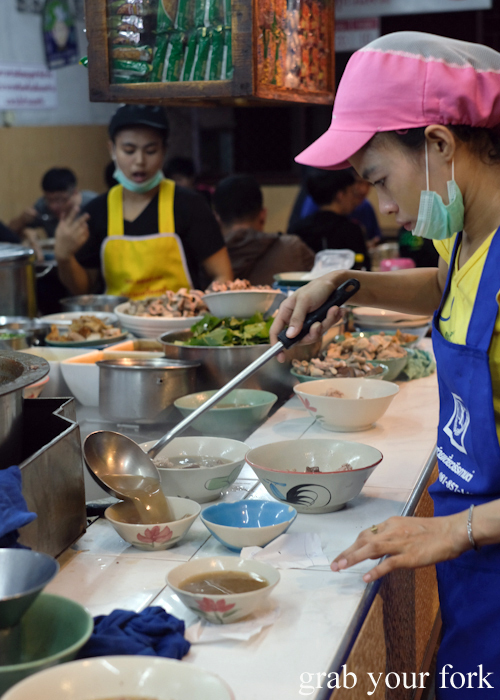 Witness organised chaos as dishes are churned out at a furious pace. Tongs are skittering noodles are plunged into stock and every minute there's another waterfall of soup being ladled into a bowl. 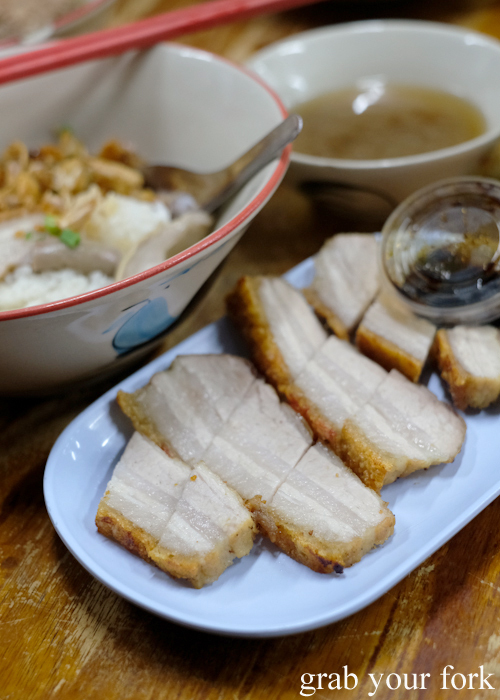 The dry congee comes with all kinds of porky goodness. 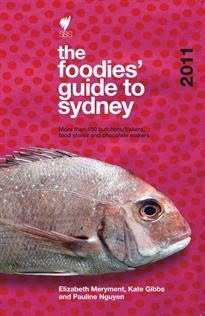 That includes a pork mince meatball, pork intestines, pork liver, crunchy roast pork and a tumble of deep-fried shallots. Some people like to pour all the soup straight into their bowl. I prefer to go the other way, dipping spoonfuls of rice into the soup. The crispy pork is so good you'll want to splurge on a whole plate of it. Do it. The ribbons of fat are cooked to a melting softness, just enough to lubricate the tender flesh crowned with a tile of crunchy crackling. 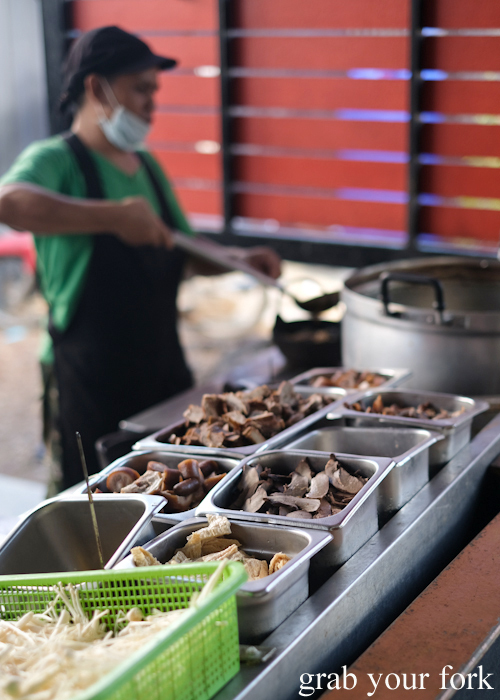 The pork soup might seem like a support act but you soon realise it's the secret star of the show. 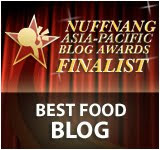 It's the foundation of every dish, its sweet and peppery porkiness proving more and more addictive with every spoonful. 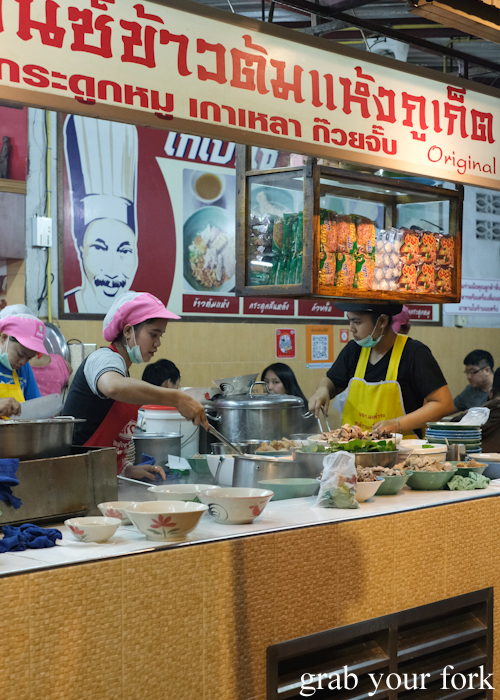 It's the base for pork and kuay jub noodles, scrolls of silky rice noodles that furl up on themselves, as well as the pork organ soup, an offal lover's dream. The huge hunks of pork blood are particularly nourishing. 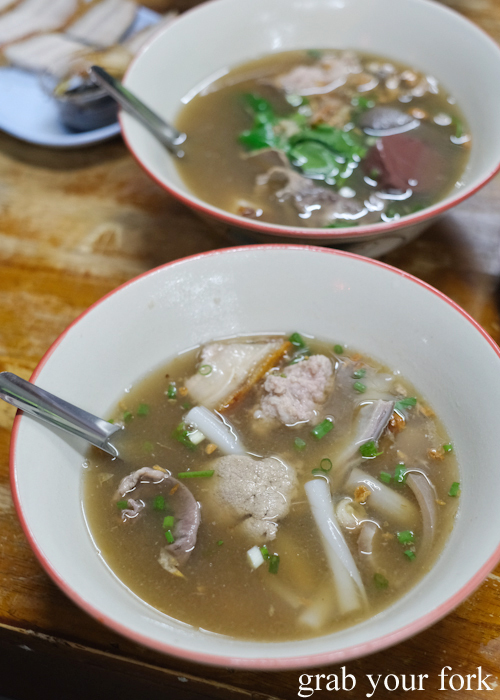 And for those who love meat on the bone, get the boiled pork rib soup. There's plenty of flesh on those bones. And on your way back to the hotel, stop by the late night trading fruit stall for your Vitamin C needs. 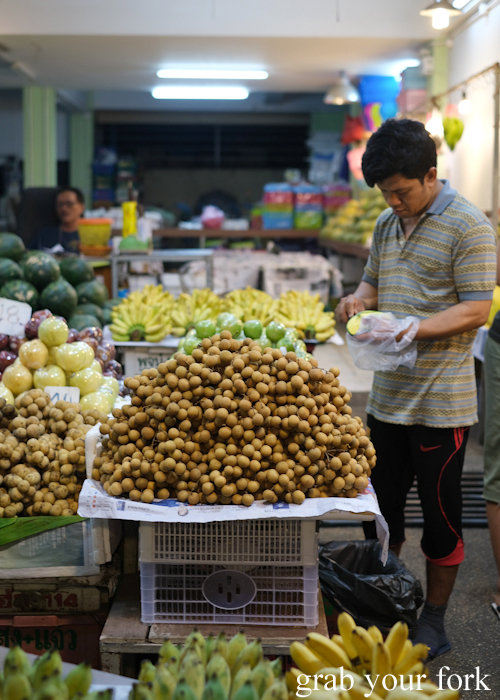 We went crazy over wax jambus, pomelo and green mangoes (AU$3.20 per kilo!). 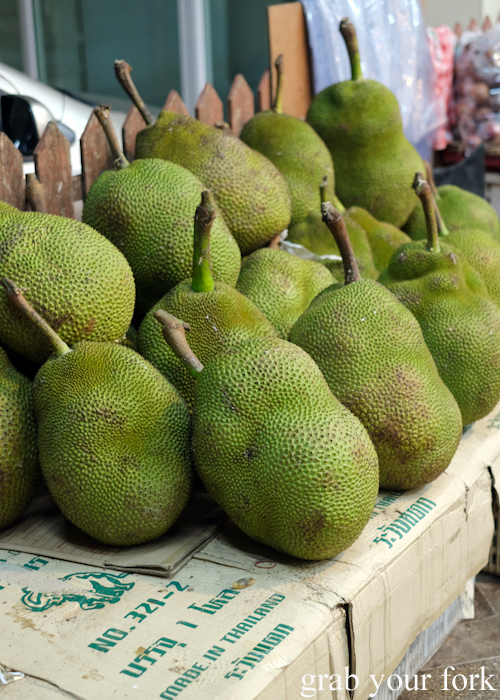 Another tip: fruit shops in Thailand will usually peel and cut your fruit for free. Talk about service! Early start? 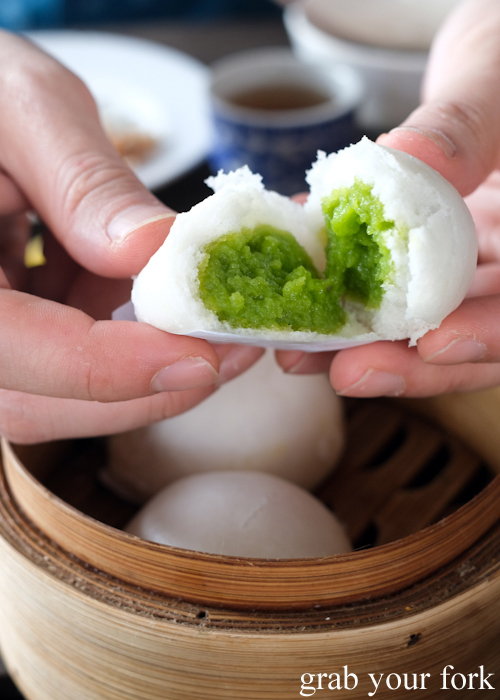 How about dim sum? But not as you know it. 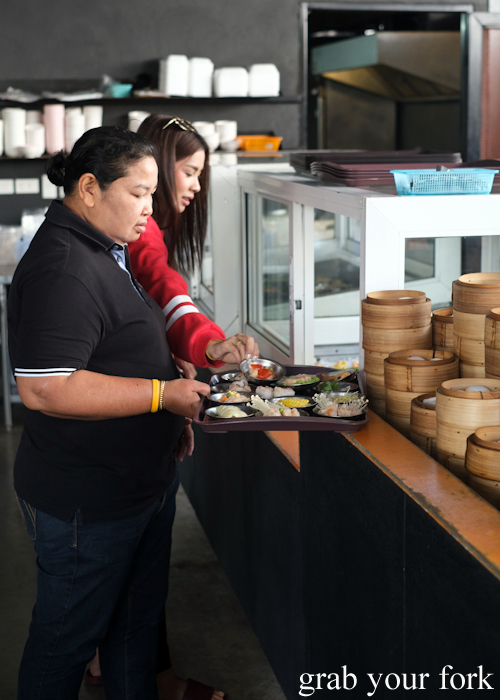 Super Dim Sum combines self-service gluttony with a la minute luxury. 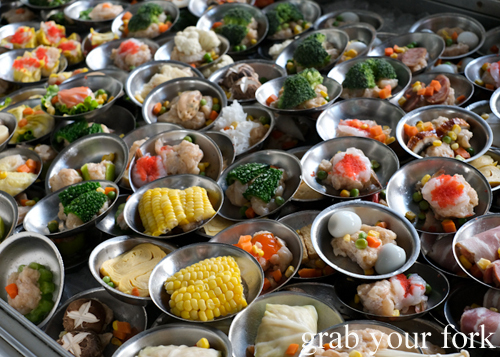 That means you get to choose whichever dishes you want, and have them steamed to order. 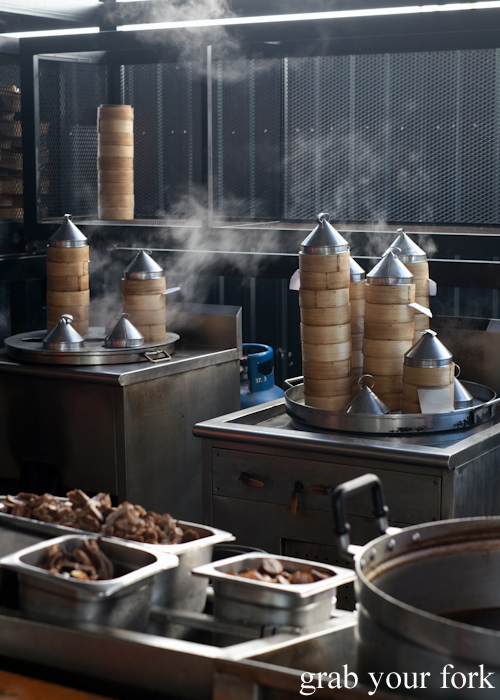 Buns and dumplings are already stacked into steamer baskets. 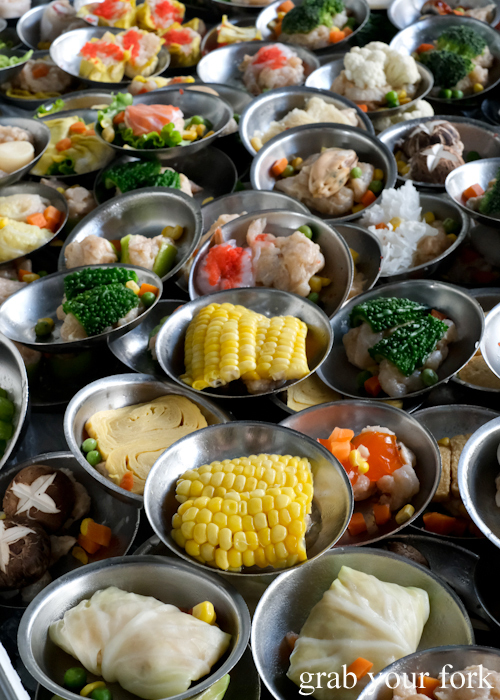 In the chiller cabinet you'll find a dizzying array of mini metal plates holding everything from sweet corn to prawns to mushrooms to fish balls. Choose whatever you like and transfer them to a tray. 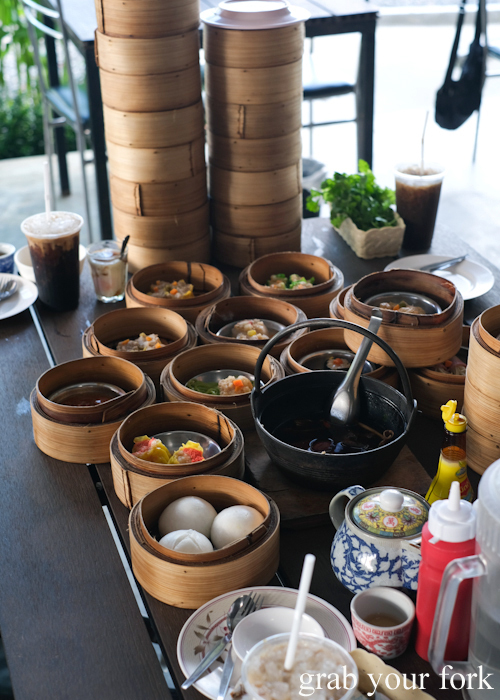 Every tray and steamer basket is the same price: 30 THB or about AU$1.30 each. 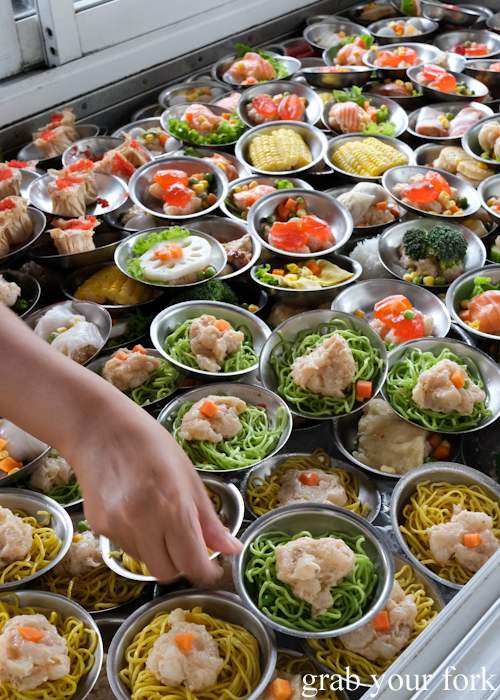 When you hand over your tray to the kitchen, each metal plate is placed into a steamer basket. All the baskets are then stacked into a tower and tagged with your docket. Needless to say, efficiency and speed are paramount here. 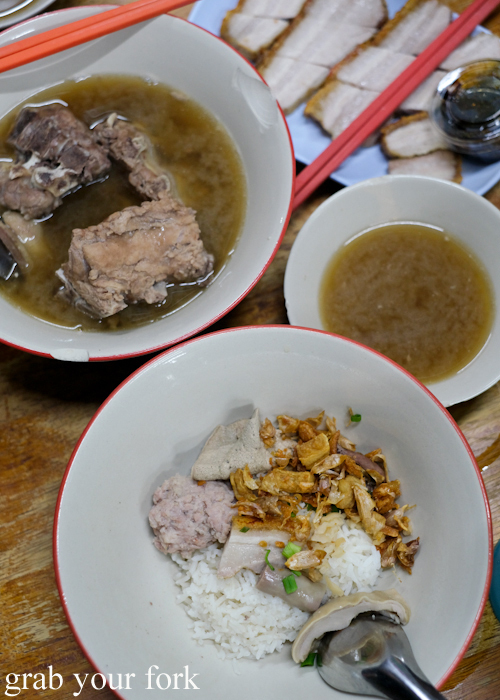 While you're waiting for your bamboo baskets to cook, you can stop by the bak kut teh station. 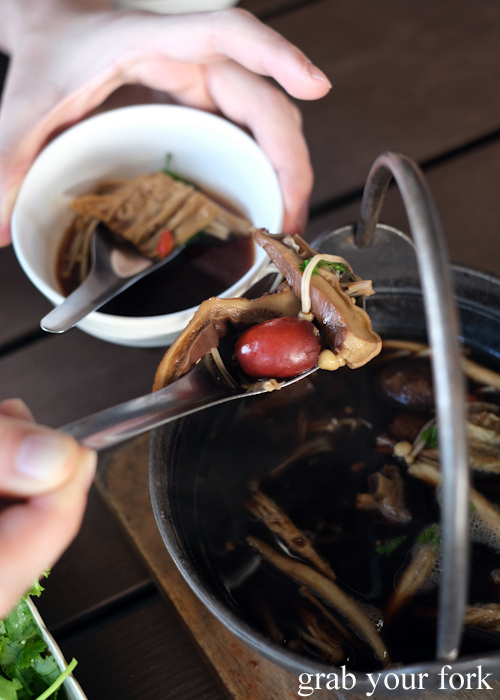 Here you can point at whatever ingredients you'd like added to your bak kut teh, a dish that translates to meat bone tea. It's one of my favourite soups, sweet and strong with Chinese herbs and spices. 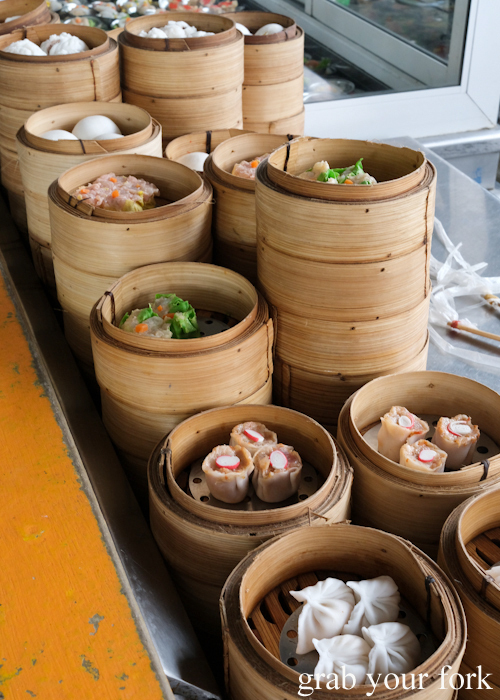 Ours is packed with mushroom, bean curd skin and red dates. 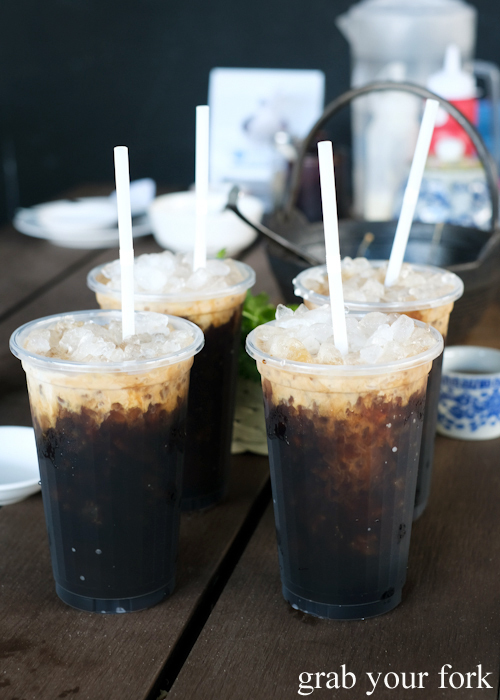 And as the humidity starts to hit, order a Thai coffee - brewed the traditional way with a stocking - cooled down with a little condensed milk and a lot of ice. It's not until our bamboo baskets arrive that it starts to dawn on us exactly how much we have ordered. Our individual orders combine to teetering skyscrapers. And our order keeps coming. We end up sharing our dishes between the four of us. It's crazy fun. And the highlight? These pandan custard buns. The custard is intensely fragrant with pandan. The bun is warm, soft and fluffy. Grab Your Fork travelled independently to Phuket. All places in this post were visited anonymously and paid for personally. Love how you've described everything. We're planning a trip to Phuket these holidays, surely keeping all this in mind! argh everything is so cheap! Holy crap this looks AMAZING!!! So jealous!